In this week’s Brooklyn Nine-Nine, Sterling K. Brown guest stars as Phillip Davidson, a dentist who is the prime suspect in his colleague’s murder. Brown is amazing in everything so there was no doubt this would be a stellar episode. It starts with Dr. Phillip Davidson coming down to the precinct to be voluntarily questioned about the murder. Jake has properly prepared the interrogation room for optimal discomfort — cranking up the heat, making the chair legs uneven, and leaving a sticky residue on the table — but despite this, Davidson is cool as a cucumber. Davidson had the motive and means and no solid alibi for the murder, but because all the evidence is circumstantial, the DA is refusing to prosecute. Jake’s plan is to get him to confess during the interrogation. 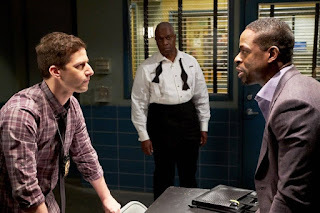 As Holt hears Jake’s plan, he decides to forgo his original plans of attending the opera with Kevin in order to help bring down Davidson. Jake’s surprised to hear Holt wants to join him in the interrogation instead of just observing behind the window like usual, but Holt says he really misses the intensity and pressure of an interrogation, so Jake agrees. Jake goes in hard, but Davidson remains calm and collected with all the right answers. Yes, he met with his colleague the night of the murder but it was to discuss firing the office assistant, who the colleague thought was stealing medicine. When Jake’s plan for an easy confession falls through, Holt begins making fun of him in front of Davidson. Jake calls him outside to find out why and Holt says he’s employing a simple strategy of “smart cop, dumb cop.” That way, Holt says, Davidson will underestimate Jake and reveal something he didn’t intend to. Jake’s not totally on board with this plan because he doesn’t want to be perceived as dumb but he goes along with it. They go back in and Holt takes the lead with probing, subtle questions while Jake jumps in with obvious ones. After a few minutes of this, Holt pretends he has a call to deal with and leaves Jake alone. Jake asks a rapid-fire list of questions including: “Have you ever been to where the body was buried?” and ending with his classic, “So did you kill him?” Davidson responds calmly to each one but he finally makes a mistake! He tells Jake that he hasn’t been up to Vernon, New York in years. Except, the fact that the body was found in Vernon hasn’t been released to the public yet. So how does Davidson know that’s where his colleague’s body was buried? Davidson covers quickly, saying his colleague’s wife told him. Even though Jake knows the wife promised not to tell anyone that detail, it’s still not enough to get Davidson. It’s just his word against hers. So Jake keeps digging. Turns out, Davidson’s uncle owns a cabin in the same town where the body was buried. But Davidson insists he hasn’t been there in 20 years. It turns out the uncle can’t confirm or discredit Davidson’s story. He hasn’t spoken to his nephew in over a year and hasn’t been up to the cabin in months. The Vernon police haven’t been able to get in contact with the sole neighbor either. Jake asks Holt to let him lie and say they did get in contact with the neighbor. Holt is completely against this strategy. Too much can go wrong. Holt decides to employ a different strategy of getting all up in the suspect’s personal space. It backfires though, because when Jake gets super close, Davidson just starts grilling him on when the last time he went to the dentist was, and the concerning amount of plaque build-up in Jake’s mouth. Jake and Holt regroup and decide on a different approach. Holt tries to insult dentists, claiming they’re not real doctors, but Davidson flips the tables and starts insulting professors with PhDs, saying they’re not the real doctors. This is apparently a trigger for Holt who gets very upset at this insult. Next, they try to break Davidson by having him look at gruesome photos of his dead colleague. But that fails too. As does Jake’s screaming while playing the guitar. When they try to dissect Davidson’s relationship with his colleague and whether there was tension there, Davidson again turns it around and dissects Holt and Jake’s relationship, concluding that Holt doesn’t trust Jake to get the job done if he was willing to skip the opera to supervise. Davidson has just succeeded in playing on Jake’s biggest fear: that Holt doesn’t think he’s good enough. Jake gets angry and starts yelling at Davidson, but he just laughs, because let’s be honest — Jake is just not intimidating when he’s upset. Jake throws a chair to show how upset he is, but it bounces off the interrogation room window and hits him in the face. As Holt and Jake regroup again — mostly so Jake can put an ice pack on his face — he tries to press the lying strategy again but Holt still refuses. It’s just too risky if Davidson catches them in the lie because then he’ll know they have nothing and the whole case will crumble. Jake says he agrees but then he dashes back into the room saying he just got off the phone with the Vernon PD who told him the uncle’s neighbor positively ID’d Davidson. Except Davidson tells him, in response, that the neighbor’s been dead for three years. And with that, Jake’s just been caught in the lie like Holt knew he would. Holt’s furious and so is Davidson’s lawyer, who’s just arrived. They’ve kept Davidson in interrogation for almost 11 hours now and have nothing. She tells them that if they reach the 11-hour mark she’s filing a harassment suit against them. This gives Jake 14 more minutes to get a confession. He and Holt leave to regroup one last time, where Holt lets Jake have it for messing this up. Jake says he just wanted to be the one to bring this guy down, and Holt asks if this is about Jake’s ego. Jake says no; he just wanted Holt to know he could do it. All of a sudden, Jake has a revelation. He rushes back into the room. The lawyer says her client won’t be answering any more questions but Jake says that’s okay — he just needs to listen. Jake paints the picture of what he thinks happened: it’s Davidson who’s been stealing meds because he’s addicted, he was confronted by his colleague who said he’d file a police report, and Davidson panicked and hit him with a glass award, losing all control and bludgeoning him to death. Then he cleaned up after himself, and rushed the body out to the parking garage, but in his haste, forgot his own car keys and phone and so used the colleague’s car keys that were in his pocket. Since he doesn’t have the GPS on his phone, he drives to the only out-of-the-way place he knows — Vernon, New York. Jake is really playing up the panicked angle, and says Davidson got lucky at every turn. This is what finally triggers Davidson. He bursts out with what actually happened. He didn’t use some dumb award to kill his colleague that could be easily discovered. Instead, he crafted a weapon out of dental polymer and then melted it down after the crime and used it in a patient’s mouth so it could never be tracked. He left his phone on purpose so it wouldn’t ping off a cell tower. And he had always planned to go to his uncle’s cabin. He planned the whole thing and planned it well. It’s only after his outburst that he realizes he’s just admitted the whole thing and ruined that perfect plan. Afterward, Holt asks if Jake knew the award wasn’t the right murder weapon. Jake says yes, he already knew from his earlier work on the case that a cleaning lady had accidentally knocked the award off the desk and shattered it weeks before the murder. Holt asks why he ran into the room with that scenario, and Jake says it’s because he knew that if he presented the idea that Davidson was just some dumb, panicked criminal who got lucky, Davidson’s ego would take over. He’d have to prove to them that he was smart enough to pull off the perfect crime. Holt tells Jake he’s proud of him, which is all he wanted.